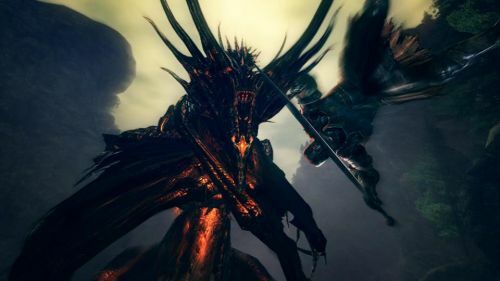 The extra content from the PC version of Dark Souls has made its way to consoles. The "Artorias of the Abyss" add-on will include all the new content that was added to the Dark Souls: Prepare to Die Edition PC port. This will add new areas, NPCs, gear, weapons, enemies, bosses and most importantly, new ways to die. It should make up five to ten hours of gameplay, depending upon your skill level, or how slowly you creep through new areas. I haven't played Dark Souls in months, and even then I wasn't very good at it. I've managed to avoid spoiling the extra content for myself. I can't wait to dive in and get crushed by a few overpowered bosses. We'll be returning to Lordran and giving you our impressions later this week, if we can tear ourselves away from Borderlands 2 and XCOM. For now, here are three trailers that led up to the launch of the PC port. I haven't watched these, so I have no idea what's going on. Skip them if you want your dying experience to be spoiler free. Okay, I have watched them, but I drink heavily. So they're new to me. That dude got messed up! I can't wait for this to happen to me! What the heck is wrong with me? I noticed that the XBL Marketplace description states that the new DLC will include, "an online match-making feature for co-op or player vs. player gameplay." A new lobby matchmaking system would basically break the summoning and multiplayer modes that distinguish Dark Souls from other titles... Hmm. This would make it more accessible. The smart money says the matchmaking is a simple arena mode for the PvP "Battles of Stoicism" we heard about at E3. I guess we'll actually have to play it and find out. Life's rough. We'll let you know as soon as possible. Dark Souls supports three player online co-op. It has a non-traditional multiplayer system, so check out our Co-Op FAQ and Review before diving in. If you like a challenge, you'll dig this game. The "Artorias of the Abyss" content is out now on the XBL Marketplace and PlayStation Store. It's $15, or 1200 Microsoft Points.